Located off of 675 at the N. Fairfield Road exit. Directly across the street from Wright State University and the WSU Nutter Center. Welcome to Hampton Inn Dayton/Fairborn, a high-soaring Fairborn, OH hotel for group, business and leisure travelers. 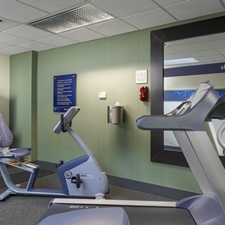 Enjoy a perfect mix of comfort, convenience and service with wonderful amenities like free hot breakfast, free WiFi, our indoor heated pool and the on-site fitness center in our newly renovated hotel. 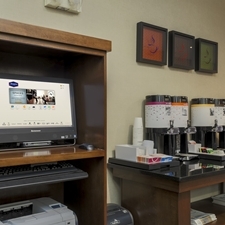 We offer complimentary bus parking for easy group travel and a 24-hour business center. Guests appreciate our commitment to thoughtful care throughout their stay. Our Fairborn, OH hotel is conveniently located right across the street from Wright State University and near University of Dayton and Wright Patterson Air Force Base. Hampton Inn Dayton/Fairborn is just minutes from many businesses including Unison Industries, Boeing, Lockheed Martin, and Speedway Corporate. Other nearby popular attractions include the Mall at Fairfield Commons, Rotary Park and John Ankeney Soccer Complex. Our friendly team members are excited to serve you during your next visit by adding value and warm service to your stay at Hampton Inn Dayton/Fairborn, the best value for hotels in Fairborn, OH.